Photo Exhibition "World of Eikando"
We will hold a photo exhibition focusing on the photographs of Katsuhiko Mizuno, who has published many photographs of landscapes and events in the four seasons of Kyoto. We are planning to sell a photobook "Eikando Zenrin-ji". Beware of spoofed e-mails by the sender's name of Eikando ! Junk e-mails have been still distributed under the spoofed IP-address of Eikando. xxxx@eikando.or.jp is the sender's address of those junk mails. The characters of xxxx are changed from time to time. We never send e-mails except for a reply for your inquiry. Those spoofed mails may be in danger of a virus. When you receive an unexpected mail under the sender's address mentioned above, please deleted it without opening. Amida-do, the main hall of Eikando temple complex, was moved from Shitenno-ji temple to Eikando in 1607. 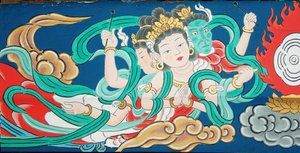 Historical documents say that Amida-do was decorated with many paintings to visualize the world of Pure Land. But 400 year-time makes the paintings fade out. 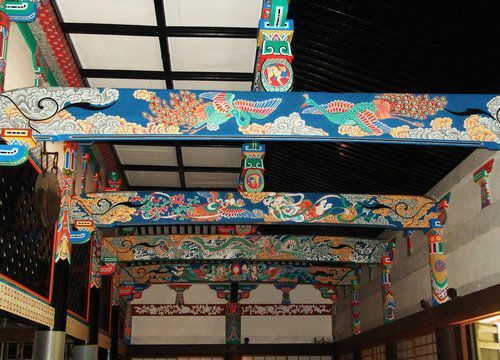 Many parts of the hall were repainted over by urushi, a Japanese lacquer. In 2006, a basic research was started to restore them. A painstaking work revealed that there were hundreds of patterns and figures on the beams and pillars in the hall. Researchers also found the handwriting by an ancient carpenter on an above part of a pillar. It says “ぬし　やぎゅう・・・　慶長十二年・・・”. “慶長十二年” means the year of 1607. This handwriting backs up a record of the historical documents. Specialists traced these figures and restored the original images and also analyzed the painting materials. For four years, many paintings are restored. The work will be completed in October, 2010. A quarter of the hall is left without any work for the future research. The following pictures are some of the restored paintings. 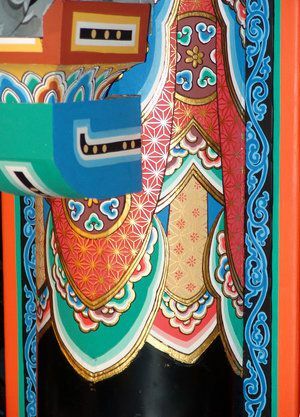 When you visit Eikando, do not miss to appreciate the restored paintings with vivid colors and gold. You will be surely impressed by them, the world of Pure Land which was an image of the Buddha's world of ancient people.